MacHeist has launched their fourth application bundle, combining fifteen apps with a retail value of $539 (if certain sales targets are reached), for $29. 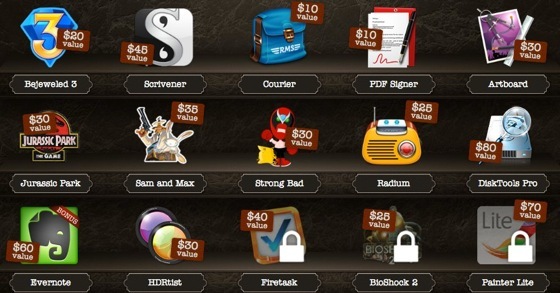 MacHeist typically assembles these bundles with a wide variety of apps, including both games and productivity programs. The last three apps will be unlocked once certain sales targets are reached. Further, 25% of each purchase goes to one of 10 charities that the purchaser can choose from. Scrivener is a very nice app for writing of any kind: novels, nonfiction, papers for class, etc. The developer is working on an iPad app which will be available within the next 6 months or so. IMHO, Scrivener is vastly superior for Word/Pages/etc. for performing research and structuring your writing. That's about 90% of the job. $29 for 15 months of Evernote Premium is worth it alone. I probably won't even download the rest of the crap. Scrivener is a really great application. I paid $45 for it a few months ago. Think I will get this for Scrivener alone! The only app that interests me is the PDF signer app... And it can be had for $10 on it's own. If you just need it to put your John Doe under some documents, Preview.app does it for free. I'm quite disappointed with the bundle. Not going to buy it this time. Some of the mission loot is fine, though. I use Scrivener professionally. It's an outstanding application for writing and I wholeheartedly endorse it. If you don't own it, the bundle is worth it for Scrivener alone. Absolutely worth it for Scrivener and Evernote alone. And with NaNoWriMo just around the corner, now is absolutely the perfect time to buy. As a feature writer and novelist, Scrivener is an absolute must. If you do ANY form of writing over a few hundred words, get Scrivener. It is a brilliant tool for undergraduate or postgraduate students, and I would also recommend it as a replacement for Word or Pages for anyone writing an essay, report, website, etc. But if you fill it up your are stuck paying $60 after that to keep your files. The funny thing is that loots from individual missions were much better than the actual bundle. I will get the bundle anyways, for 26 dollars (after mission discount) it is a no brainer. But I will use only Scrivener and Radium and maybe Evernote.